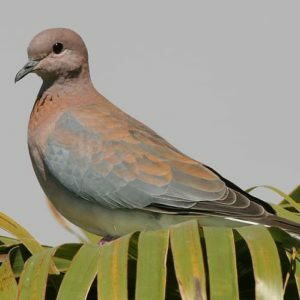 Small, slim, short-winged dove. Head and neck pinkish with broad black-speckled rufous half collar at base of fore neck. Juvenile lacks half collar. Monogamous. Territorial. Forages on ground. Not shy. Drinks twice a day. primarily seed. Also eats nectar of aloe, termites, ants, snails and fruit. 22 to 24 cm Resident primarily seed. Also eats nectar of aloe, termites, ants, snails and fruit.